Magnus Carlsen is a Norwegian Grand Master. On January 1, 2010, Carlsen became the youngest chess player in history to be ranked #1 by FIDE. He was then 19 years and 32 days old. In May 2014, Carlsen reached an Elo rating of 2882 – the highest attained by any chess player in history. Carlsen is the reigning world chess champion in Classical Chess, Rapid Chess and Blitz Chess. He won the world chess champion title in classical chess by defeating Viswanathan Anand in the World Chess Championship 2013. He successful defended his title against Anand in November 2014. Carlsen is known for his tough attacking style, but as he transitioned from teenager to adult player he developed a more universal style that is less predictable. Compared to many other top players, Carlsen is less focused on opening preparation. He masters many different openings, which makes him a difficult player to prepare for. Magnus Carlsen lives in Norway with his parents and two sisters. His fond of skiing and is a skilled ski-jumper. He has participated as model in several advertising campaigns, including the G-Star Raw’s Autumn/Winter 2010 campaign with Liv Tyler and the G-Star Raw’s Spring/Summer 2014 campaign with Lily Cole. Film director J.J. Abrams offered Carlsen a role in the movie Star Trek Into Darkness (he was to play a chess player from the future) but Carlsen declined since it couldn’t manage to get a U.S. work permit in time. 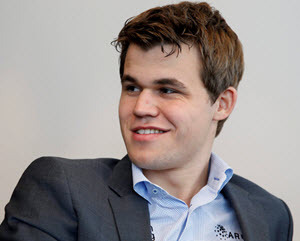 Through his Norwegian company Play Magnus AS, Carlsen has released an iOS app that allow the user to play against a Carlsen-tuned chess engine from the ages 5 to 23. Creating the app was possible tanks to thousands of Carlsen-games that has been recorded since he was a child. Sven Magnus Øen Carlsen was born in Tønsberg, Norway, on 30 November 1990. His parents Sigrun Øen and Henrik Albert Carlsen are both engineers. Carlsen participated in his first tournament when he as 8 years and 7 months old. It was the youngest division of the 1999 Norwegian Chess Championship, and Carlsen scored 6½/11. In October 2002, Carlsen placed 6th in the European Under-12 Championship in Peñiscola. In November, he tied for 1st place in the World Under-12 Championship in Heraklio, placing second to Ian Nepomniachtchi on tiebreak. Carlsen obtained his first IM norm in January 2003, his second in Juni 2003 and his third in July 2003. He was officially awarded the IM title on August 20, 2003. Carlsen studied at the Norwegian College of Elite Sport, where he was coached by Norwegian Grandmaster Simen Agdestein. Carlsen participated in the 2004 FIDE World Chess Championship, thus beating the old record for youngest player. He was knocked out by Levon Aronian in the first round. Carlsen participated in the 2005 Chess World Cup in Khanty-Mansiysk, Russia. He ended up on place 10 in the tournament, and was the youngest player ever to become a World Championship Candidate. Since Carlsen had won the 2004 Corus Chess Tournament C-group, he was invited to the B-group for 2006. He finished on a shared 1st place with Alexander Motylev, thereby qualifying for the A-group. In 2007, Carlsen made his debut in the Corus Chess Tournament A-group. He ended up in last place, with four wins and nine ties. When Carlsen returned for the 2008 Corus Chess Tournament A-group, things turned out much better for him than the previous year, and he finished on a shared 1st place with Levon Aronian. Carlsen won the 2010 Corus Chess Tournament A-group. Carlsen won the 2012 London Chess Classic. His elo rating became high enough to beat Gary Kasparov’s old record. In 2013, Carlsen ended up with +5−2=7 i Candidates Tournament. He won after tie-break against Vladimir Kramnik. Carlsen now had the right to challenge reigning World Chess Champion Viswanathan Anand. The 2013 World Chess Championship was played in Chennai, India, in November. Of the ten games, Carlsen won three and tied seven. Viswanathan Anand lost his title and Magnus Carlsen was crowned World Chess Champion. In 2014, Anand challenged Carlsen for the World Chess Champion title. The 2014 World Chess Championship was held in Sochi, Russia in November. Twelve games were scheduled, but the twelfth was never played since the score was to 6 ½ – 4 ½ to Carlsen after eleven games. Carlsen had thus successful defended his title and remain the World Chess Champion.